There is an old adage that says “correlation does not equal causation”. Just because two metrics, or trends, move in the same direction at the same time doesn’t mean that one causes the other. If my children act wildly every time they return home from their grandparents house, it doesn’t mean that their grandparents caused them to be wild – at least not directly. No, of course not. It’s the sugar that does that. But while we shouldn’t assume that correlation equals causation, there are times – on the margin – when interesting correlations should cause us to look deeper. This is one of those times. As a way of introduction, investing “on the margin” is when individuals borrow money to invest in securities, using their existing securities (that are also invested) as collateral for the loan. For borrowing the money, the individual is charged an interest rate. The goal for the investor is to earn a higher return on the investments than he or she is charged in interest. Below is a chart that shows an interesting correlation. The blue dotted line is the S&P 500 index, which measures the stock prices of the largest 500 companies in America. The red and green shades measure the net credit balance in individual investor accounts. 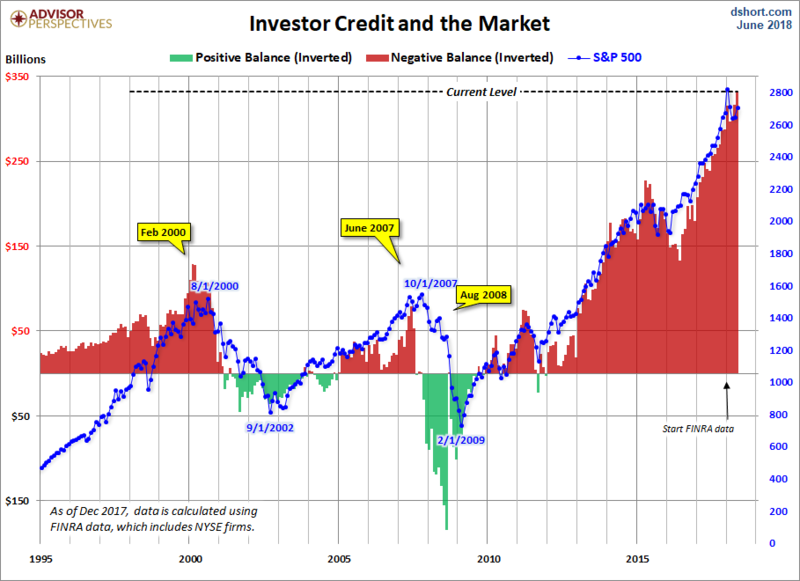 The red indicates periods of time when investors had a negative credit balance and therefore were borrowing money to buy stocks. In contrast, the green areas are periods of time when investors had positive credit available. The correlation is unmistakable. Investors became highly leveraged in 2000 (Tech Bubble) and in 2007 (Credit Crisis) as the markets climbed to all-time highs. Nearly concurrently they deleveraged as the S&P 500 entered bear markets in 2000 and ’07. Likewise, the smaller correction in 2011 also correlated with a (breif) positive credit balance and the even smaller pullbacks in 2015 and early ’16 coincided with a drawdown in margin debt. Today, investors have invested with borrowed capital more than ever before. We should be cautious about drawing hasty conclusion since correlation does not necessarily equal causation. However, there are several things this chart can tell us. Investors are currently euphoric. Margin investing brings with it increased opportunities and increased risks. When prices go up, investors make money on borrowed capital – a great deal! However, falling prices require investors to pay back borrowed capital that just lost value. Hence, positive balances in margin accounts will typically coincide with volatile periods, as investors remain cautious. Conversely, the all-time highs in margin debt today tells us investors are very confident the market is going up. Is their excitement driving prices higher? It certainly isn’t a hindrance. The potential for abrupt and deep market drops are massive. As prices go up, investors enjoy making money on borrowed capital. When prices turn south, however, many receive “margin calls”. Margin calls put extra selling pressure on investors, and can lead to rapid price declines. Not only are investors pressured to sell the securities they purchased with debt, but they may have to sell securities they own to pay back the debt. With margin debt at all-time highs, the potential is high for sudden selloffs. A similar problem exists with ETF’s, which have become popular in recent years. But that is a topic for another blog. The Federal Reserve’s ultra-low interest rate policy is the likely culprit. We have previously discussed the FED’s suppression of interest rates as a primary driver of rising prices. In real estate, bonds, and even corporate stocks buy back plans, prices have increased dramatically. It appears individual investors have also gotten in on the fun. The build-up of margin debt has coincided with the FED’s experimental policies. At just under $350 billion in negative investor credit, effective margin debt is a drop in the bucket of the over $30 trillion U.S. stock market. This might suggest to some that analyzing margin debt is irrelevant. However, that is why my conclusion is not that a reduction in margin debt will cause a large market loss. Or in contrast, that another increase in margin debt will cause the market to drive higher. But it also brings up another interesting metric for valuing the US stock market: Total Market Capitalization. This will be the subject of the next blog, and is yet another reason for investors to be cautious. But while the size of individual margin debt is only about 1-1.5% of the total size of the US market, individual behavior is an important factor in understanding the larger US market. And it is very clear that irrational exuberance is carrying the day. Sign Up to receive up-to-date emails and blog posts from Plan Financial! Past performance is not a guarantee or a reliable indicator of future results. All investments contain risk and may lose value. This material contains the current opinions of the author but not necessarily those of Plan Financial and such opinions are subject to change without notice. This material is distributed for informational purposes only. Forecasts, estimates, and certain information contained herein are based upon research and should not be considered as investment advice or a recommendation of any particular security, strategy or investment product. Information contained herein has been obtained from sources believed to be reliable, but not guaranteed. No part of this article may be reproduced in any form, or referred to in any other publication, without express written permission. Plan Financial is a trademark or a registered trademark of Plan Life & Wealth Management, Inc., in the United States. © 2018, Plan Financial.